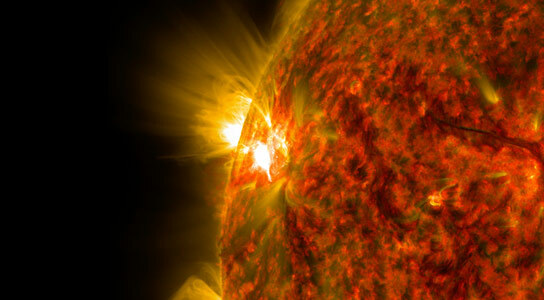 NASA’s Solar Dynamics Observatory observed a third mid-level flare from the Sun. The flare was classified as an M5.4-class flare. On November 5, 2014, the sun emitted a third mid-level flare from a region that rotated over the left limb of the sun on November 3. The flare peaked at 10:46 p.m. EST. Solar flares are powerful bursts of radiation. Harmful radiation from a flare cannot pass through Earth’s atmosphere to physically affect humans on the ground, however — when intense enough — they can disturb the atmosphere in the layer where GPS and communications signals travel. The number provides more information about its strength. An M2 is twice as intense as an M1, an M3 is three times as intense, etc. This movie shows 8 days – from October 19-27, 2014 — in the life of the largest active region seen on the sun since 1990, including five X-class flares that erupted during that time. Be the first to comment on "SDO Detects Third Mid-Level Flare from New Sunspot"